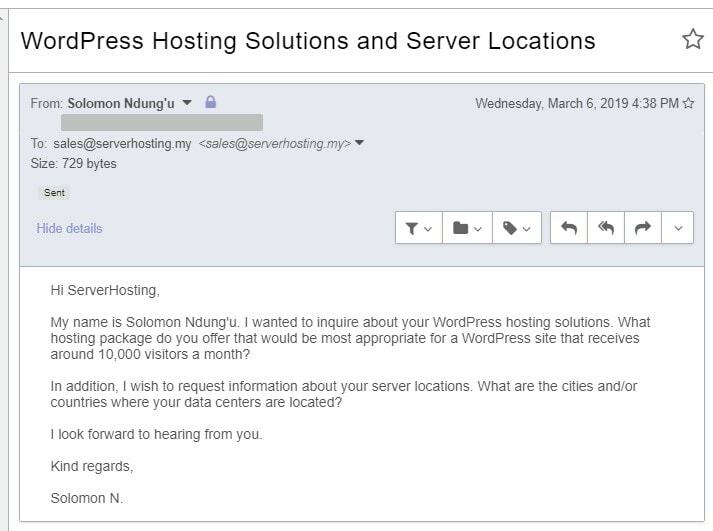 ServerHosting.my Review 2019: Is ServerHosting.my a Good Hosting? ServerHosting.my shows a lot of promise, so it’s a shame that its dedicated server, VPS, and colocation services are all “Coming Soon”. ServerHosting.my is a division of Malaysian technology company TechAvenue Sdn Bhd. It is among the top 20 web hosting companies in Malaysia by market share, and it prides itself on high customer retention. This hosting vendor uses the carrier-neutral data center facilities of the AIMS Group of Companies that has data centers located in several Malaysian locations including Kuala Lumpur, Penang, Johor Baru, Cyberjaya, and Kota Kinabalu. The ServerHosting.my website is available only in English. The “KVM Virtualizations Malaysia” VPS hosting solutions use virtualization infrastructure to operate the same way as dedicated servers but at a fraction of the cost. ServerHosting.my uses enterprise-grade Tier III data centers with several redundancy measures, including round-the-clock power connectivity to ensure smooth operations. It uses dual lead-ins, high redundancy distribution techniques, and backup generators, and it is connected to East Asia’s top internet providers: HKIX and MyIX. The servers are monitored 24/7 to ensure that any faults are detected as early as possible, and this vendor uses SSD storage and Intel E5 technology to deliver faster-loading websites. ServerHosting.my has designed its solutions to meet the needs of medium-sized businesses and large corporations. Its packages are priced low in Malaysian ringgit, and they come with a 30-day money-back guarantee. It’s unclear if the packages can be purchased at all, since all you see next to each option is a “Coming Soon” indication where you would expect the buy button to be. Whether there are any free trials or discounts, or billing cycles other than annual, is equally unclear. To find out more, you’ll have to contact the company’s 24/7 support team, which you can do by email, ticketing system, or support telephone number. The final bit of bad news is that my exploratory email went unanswered. There’s a lot to be liked about ServerHosting.my. Its attractive website advertises a range of VPS hosting solutions, dedicated servers, and colocation services. But these are merely ‘advertised’ because, currently, you can’t actually buy them. See some dedicated server, VPS, and colocation services at ServerHosting.my. Wondering how ServerHosting.my stacks up against other Web Hosting companies? Enter any other Web Hosting company and we will give you a side-by-side comparison.